I love this sign. 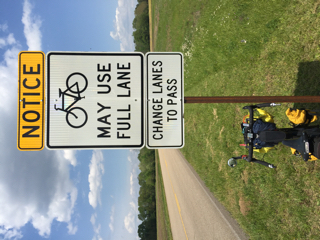 Motorists are supposed to change lanes to pass bicycles on the Trace. My experience was that many drivers did change lanes. A good many didn’t move their front wheels over the line, but still gave me much more clearance than I typically have on a highway. There were exceptions of course, people who came much to close to avoid slowing down because of on coming traffic. The speed limit is 50 mph. Some where obviously in too much of a hurry to stay near that posted limit. 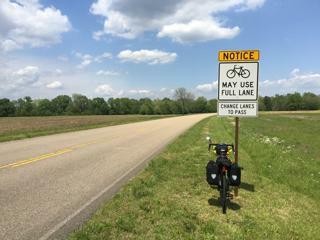 Another sign on Natchez Trace I really like is the one prohibiting commercial traffic. That one is not always heeded either. I saw commercial vehicles many times. 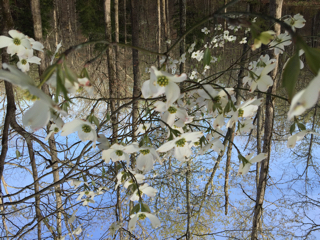 The issue may be limited enforcement in the early spring. 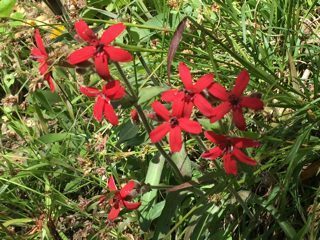 Most of the time I had pleasant time along the Trace, despite two full days of rain. 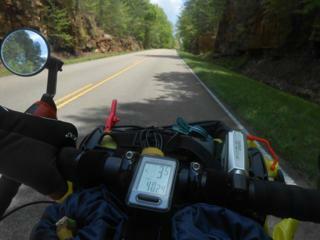 The northern section near Nashville, TN is hilly. Some of the grades are long. 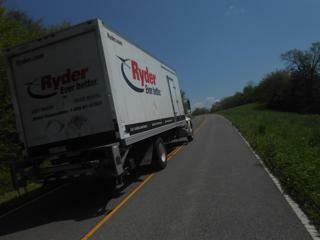 the photo shows me climbing a hill at 3.5mph. That is about as slow as I can pedal a fully loaded touring bike while maintaining balance. 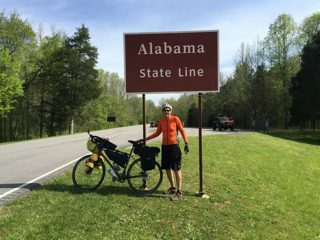 Since I turned around at Tupelo, MS, I got to climb the hills both ways. 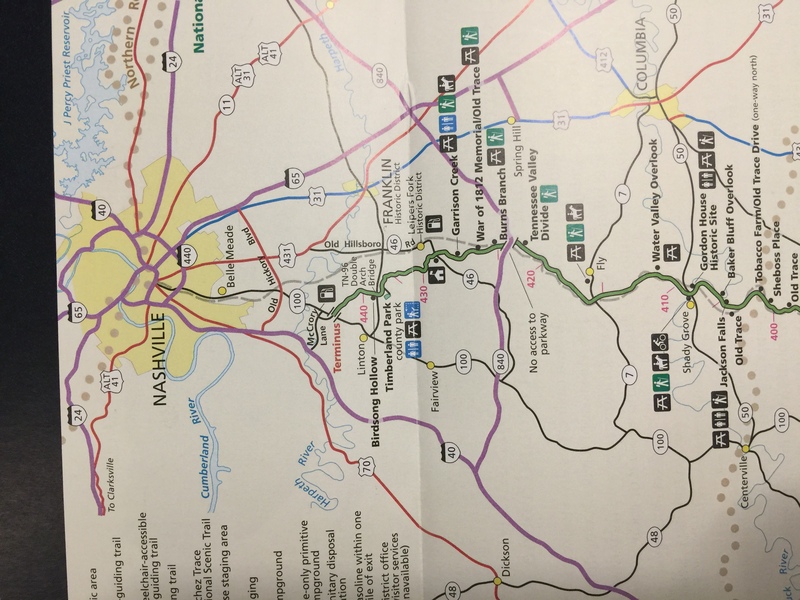 With about 45 pounds of gear, food and water, it was challenging. 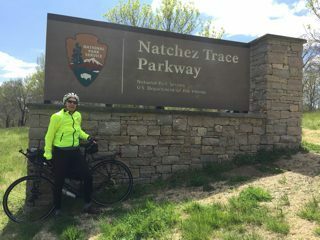 If I ride the Trace again, I am thinking that starting at Natchez which will give me time to be ready for the hilly sections to the northern. 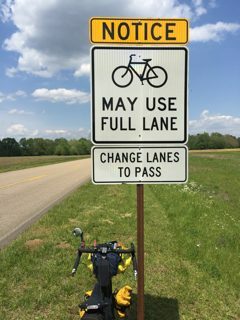 I have been very pleased that so many drivers actually charge lanes to pass bicycle. 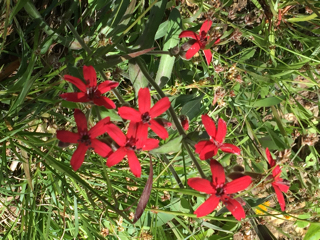 I will write more about this later. 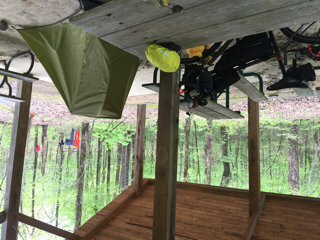 I was thankful to find a shelter where I could setup my tent when I arrived in the rain. I didn’t have to deal with my wet raingear and clothing. 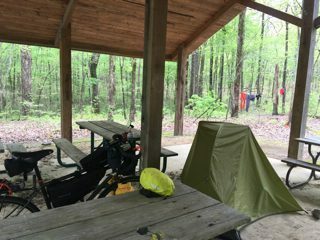 Day three I rode from the campground at the Meriwether Lewis site to the historical site of the Culbert Ferry across the Tennessee River. A lady stopped there with a small son asked if I would like my picture taken. She said she didn’t think my arms were long enough. The next day it rained almost all day. 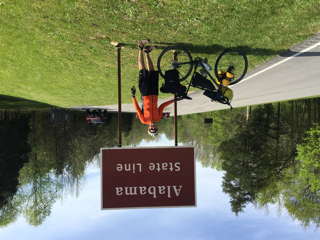 I took a quick picture at the Mississippi Line and kept riding toward Tupelo. 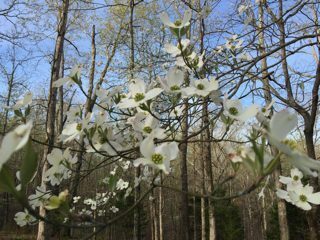 Last week dogwoods were in bloom along the Trace. It has been beautiful ride. I am finally on the way. Some of you may notice the lack of gear in this photo. I parked in long term parking and rode up to the entrance and back before I loaded my bike. I should have run a Strava segment to see the elevation gain. 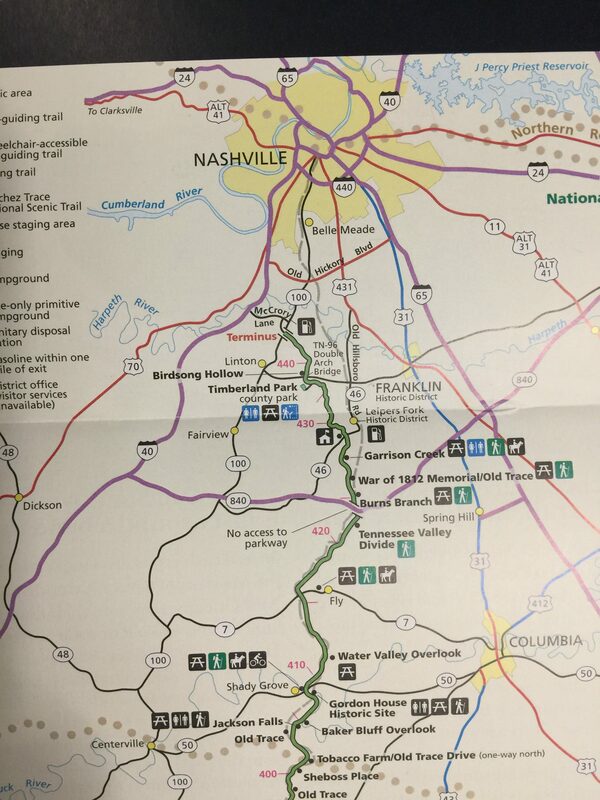 My goal today is is the bike only Campground at route 50. 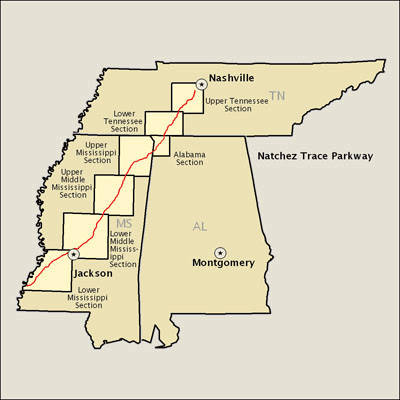 This is an overview of the Natchez Trace Parkway. 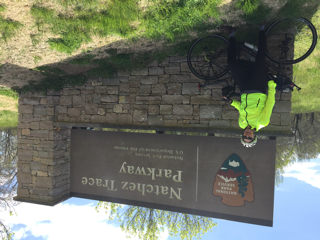 I will be riding 444 miles to Natchez and ride back to the northern terminus. I will be riding a Specialized AWOL with Schwalbe Marathon plus 700x37c tires. 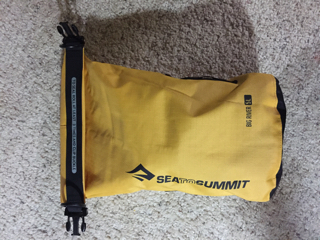 Imagine my surprise and disappointment when I opened this brand new Sea to Summit Big River Dry Bag. The first one I opened a few weeks ago was fine. Without the matching clasp, it isn’t going to create a water tight seal at the top. These bags ride on the Blackburn Outpost Cargo Cages on the fork. Mounted pictures soon.